Airports of Thailand announced that from February 3rd, 2019 all smoking rooms inside the six major international airports will be closed. Smoking rooms at Bangkok Suvarnabhumi airport, Bangkok Don Mueang airport, Phuket airport, Chiang Mai airport, Hat Yai airport and Mae Fah Luang Chiang Rai airport will be closed. 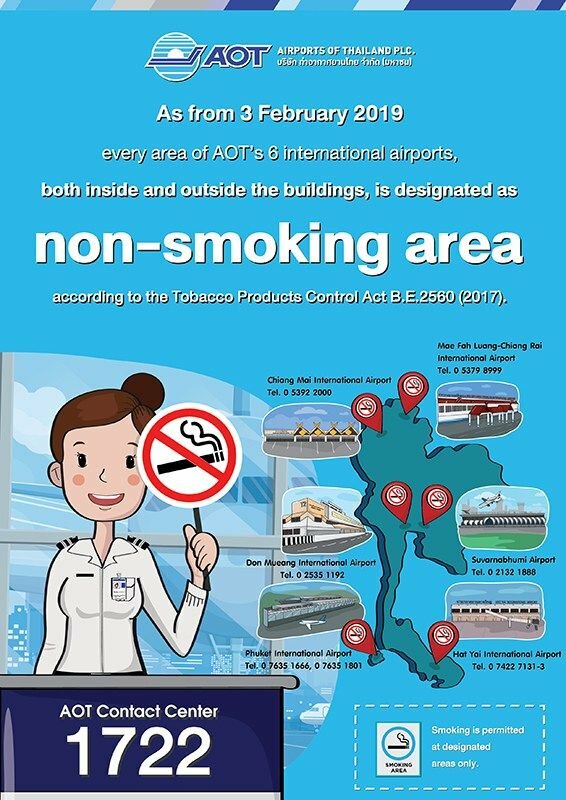 There are designated smoking areas outside the terminals, but it is against the law to smoke within five meters of an entrance or exit of any public building in Thailand. BANGKOK, Oct. 19, 2011 /PRNewswire via COMTEX/ — All airports in Thailand, including Suvarnabhumi Airport in Bangkok, have not been affected by the floods and are operating as usual.